Treat yourself to our Very Large Burford Brown eggs for your chance to become a golden baker with our latest competition. Hidden inside our Very Large Burford Brown egg boxes for a limited time only is a voucher giving you a chance to win one of five artisan mixers. 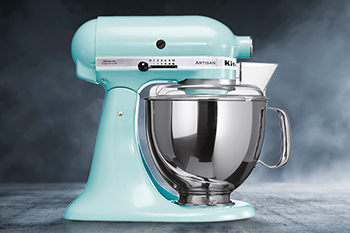 The ice blue, artisan 4.8L stand mixer by KitchenAid fuses legendary design with outstanding engineering. The standard flat beater, dough hook, whip and 3L bowl makes it the ultimate culinary companion and a fabulous addition to any kitchen. From sweet treats to savoury bakes, the versatile appliance is perfect for kneading all kinds of dough and whisking mixtures – not to mention perfectly colour-coordinated with our pretty blue Old Cotswold Legbar eggs so it looks great too. Until Friday 24th May, customers can enter our free prize draw on our competitions page here where five golden winners will be drawn at random during the following week. So, if you needed an excuse to give our Very Large range a try, get cracking and pick up a box or two next time you’re in store. Good luck to you all!